While all of the climate variables measured by TAHMO hydro-meteorology stations are important for researchers and scientists, precipitation data are often the most valuable for farmers, weather insurance providers and other African stakeholders. Unfortunately, precipitation is also one of the most difficult variables to measure accurately, especially when rainfall is very light or very intense. 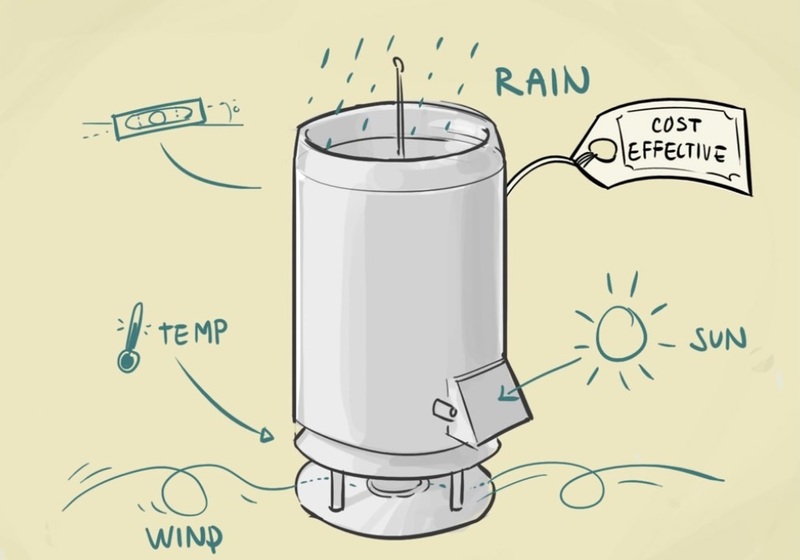 Traditional rain gauges use a tipping bucket design, which incorporates a rocking mechanism designed to tip after filling with a pre-determined volume of water. 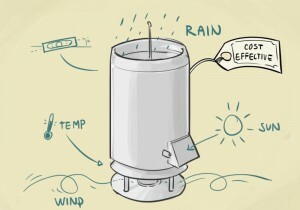 If the bucket does not fill completely, the rocking mechanism does not tip, so the gauge’s ability to record small rain events over short time intervals is often limited. Further, in high-intensity events, the buckets splash and the time of tipping becomes a limitation, so the gauge under-reports. Additionally, the tipping bucket gauge’s moving parts make it susceptible to mis-calibration and failure in environments where dust and insects are prevalent. In an effort to mitigate these challenges, Decagon Devices, Inc. recently designed a new, no-moving-parts rain gauge ten times more sensitive than most tipping bucket gauges. The gauge, which is incorporated in all new TAHMO stations, measures precipitation depths as small as 0.02 mm. It does so by directing collected water between two electrical contacts and calculating the size of the individual drops. In addition, the gauge measures the electrical conductivity of the water, which, when combined with soil water data, allow quantitative partitioning the water which infiltrates into the soil and that which runs off, the key requirement for calculation of a local water balance and aquifer recharge. The gauge has performed well in lab and field tests, and is able to measure events ranging from the formation of dew to heavy storms with intensities of over 200 mm/hr. Also, because the gauge measures precipitation electronically, calibration can be both dynamic and adjusted remotely—critical features for the regions where TAHMO works. We believe that advances like these will continue to reduce the costs of data collection while improving data quality, and our partnership with Decagon continues to produce exciting results!